- You can charter a motor yacht or sailing boat as a bareboat, skippered or fully crewed from Zadar, Sibenik, Split or Trogir. Dear visitors, on our site "www.yacht-charter croatia" you can find wide selection of motor yachts, catamarans and sailing yachts for charter in Croatia. Nautilus Yachting operates in yacht charter business for over two decades with own yachts and private yachts under our management. In addition, we have established cooperation with several reputable charter companies which are among the best in Croatia, so we are confident that whatever your boat requirements are, we can find the right choice to match them. We have started this site as a site for all boat enthusiasts wishing to charter a powerboat or sasiling yacht in Croatia and to present, in one place, complete information about charter yachts in our offer. The presentation page of each boat is unique and refers to the actual boat you will be using, not one “like it”. On each “boat page” you will find manufacturer’s photos but also actual photos of the boat taken at our charter bases. All original content and photos are copyrighted by Nautilus Yachting. Since we represent group of private yacht owners, and "hand picked” yachts from several Croatian charter companies we have personally inspected and evaluated each yacht and boat in our offer to ensure each vessel offered here meets our demanding standards. We know the yachts, their owners, managers, crews and skippers very well and photos and their descriptions represent our true impressions about them. Our charter fleet consists of a variety of different and high quality motor yachts, catamarans and sailing yachts, which are equipped to meet the highest demand of comfort and safety, from Beneteau, Bavaria, Jeanneau, Elan, Salpa, Sealine, Sea Ray and other leading yacht builders. The fleet includes a range of yachts from 15 to 55 ft and can be taken on either a bareboat or skippered charter basis. Motor yachts and power boats are an ideal way to explore the numerous Croatian islands and towns on the Adriatic coast and will please those who enjoy the speed and are prone to change the destination daily. You can use our service in following bases along Adriatic coast - marina Sukosan - Zadar, marina Sibenik, marina Trogir, marina Split and marina Dubrovnik. All our bases are carefully chosen, in vicinity of most attractive cruising area that Croatia has to offer. Click here to search motor boat, catamaran or sailing yacht by location and to learn more details about our bases. 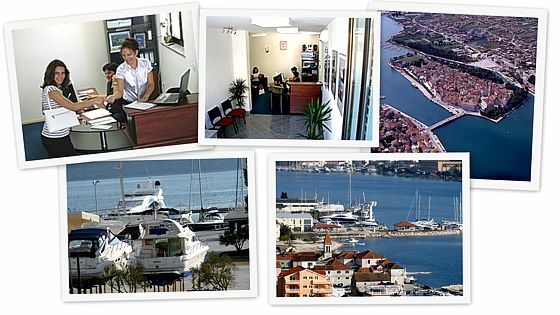 The Nautilus Yachting head office is located in Trogir, in central Dalmatia. To read more about Trogir and to see some nice photos of this Adriatic jewel click here.